So far all I see is a bunch of snot-nosed, deficit-financed, government employed, union slugs spewing nonsense, but not one drop of blood. Hey union guys, this isn’t 1945, except maybe in terms of the National Debt. Back in the day, American unions used to fight so-called greedy capitalists for higher pay, greater benefits, and better working conditions, but that was then, and this is now. 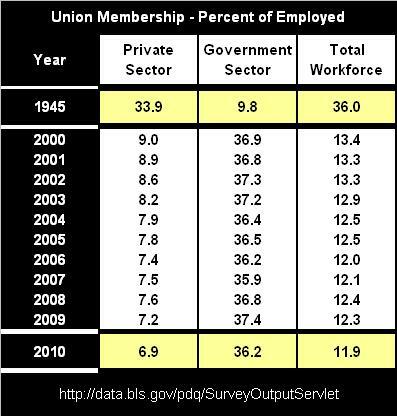 Today, almost all union members are government employees. What’s up with that? Who are these guys fighting against? Can American taxpayers who pay your salaries really be equated to the so-called ‘robber barons’ of the past? I don’t think so. Most of us are just fighting for survival. By us, I mean the other 88.1% of the workforce who are not union members. When a small minority (11.9% of loud-mouthed, snot-nosed, whiny, union cry babies) can impose its will upon the majority (88.1% of responsible, hard-working, non-union juiced, taxpayers) – that’ll be the day. Good luck with that fight. Back in 1945, almost 36% of American workers were represented by unions, but according to the U.S. Bureau of Labor Statistics, that number had dwindled to just 11.9% by the end of 2010. Although there has been a noted increase in the number of public employee unions since the 1960s, the decline in private-sector union membership has been most telling. 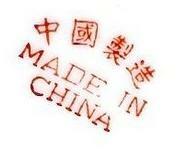 If union membership was worth its weight in dues, then most of the goods that America purchases today wouldn’t be stamped “Made in China”. At the height of union popularity in the 1940s, only about 9.8% of government slugs were represented by unions, versus 33.9% of private sector workers. However, by the end of 2010, those proportions had flipped. Today 36.2% of public workers are represented by unions while private sector union membership has plummeted to a mere 6.9%. The U.S. Bureau of Labor Statistics most recent survey indicates that union membership in the U.S. has fallen to just 11.9% of the total workforce. I’m sorry, but all of you public union slugs need to shut the hell up and accept what we decide. We don’t work for you; you work for us.